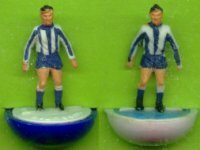 The classic heavyweight was used throughout the Subbuteo boom which started with the 1966 World Cup and continued through the 1970s as Subbuteo conquered Europe and beyond. Hand-painted in colourful bases, this attractive figure can take a large slice of the credit for Subbuteo's success. The following pages show the different teams produced during the heavyweight reign. As illustrated, there are plenty of different box types through the classic heavyweight era. Mid 1960s box - Mostly used for the earlier short-sleeved figures, the first classic heavyweights appear in these boxes circa 1967. An oddity. This box has the white sides and staples of the earlier box, but a later logo. It comes from the late 1960s, and the goalkeeper is still on a metal rod. Late 1960s box - Has green box sides and the 1960s kicking footballer logo. Goalkeepers are usually on metal rods. Circa 1968-69. Early 1970s box - Identical box to the late 1960s, except that this one has the 1970s logo. Now goalkeepers are on the green plastic rod. Mid 1970s box - A big redesign of the box lid with the addition of a large kicking footballer logo. There are two slightly different versions. Last of the "long" boxes, this was used up to team 190 (plus the original 191-195 and some named sides). Circa 1974-76. Single Window box - Easily crushable box with card wrap and slide-out tray. Two versions (with or without card end flaps). Circa 1979-80 or 81. Teams to 328, and probably higher with later figures. As well as splitting up the team lists into different sections, I've also had to split up the problems. These are the ones that apply to the heavyweight. Example 1. Celtic figures on reversed bases (ref 25). I want to buy an Arsenal side. which base colours should it have? I have a Celtic side, but the base colours are different to those in the catalogue. The fact is that there are no standard base colours for teams. These colours do not even stay constant in the catalogues. Subbuteo just seemed to use whatever they had available at the time. These are usually matched to the main colours of the kit, but even this is not certain. The most common variations are where the inner, and outer base colours are reversed. The two Celtic teams shown above demonstrate this. I hesitate to say this, but the more usual version is to have the dark colour on the outside and the light one on the inside. This white inner becomes much more the norm for the later pegged teams (zombies and lightweights). This means that when collectors refer to a "reversed base" team, they often mean a team with a white outer and a coloured inner. These can look very attractive in play, but it is just personal preference. Of course for some teams, the "reverse" is the most common base. Man City (ref 5) are usually on light blue inners, with white outers and Arsenal (ref 16) are usually red with white outers. With bases where white is not involved, which base is the reverse of the other becomes meaningless. Interested in heavyweight base variations? Check out Mike Peacock's website, which illustrates many of those found within the collecting community, and includes some very inappropriate combinations. While on the subject of bases, you may also find variations in the lettering on the bases. The word Subbuteo is repeated twice around the inside part of the base. If you look down from the top, these words can be facing the same way, both be facing outwards, or both be facing inwards. In addition to this the size of the letters can change. I don't know whether this might help date figures, or whether it makes no difference at all. The unillustrated catalogues of the 1960s mention shirt and short colours, but not sock colour. The flat plastic figures don't have coloured socks, so coloured socks were first introduced with the early OO scale figure. The sock colours are fixed for consumers when the first illustrated team poster/catalogue was produced for the 1973-74 season. However, if you think this stopped variations from occurring then think again. The first kit to be issued for a sock variation is open to debate. Team 116 is like reference 6, but with red socks. In its defence, this splash of red does make the kit look different. 119 and 136, which differ only in sock trim, are probably the first good example. I've included a number of sock variations within the lists, but do not be surprised if you find different ones. At the end of the 1970s, teams started to add a bit of fancy trim to their kits. Often these were down to the kit manufacturers (i.e. Adidas strips down the sleeves). In some cases, a new figure was produced. Ref 211 Wolves is a good example of this. However, sometimes the figures were produced at odds with the catalogue. I think this was most likely to occur when a reference number only covered one team. So the colours could change without affecting other clubs. In the above example, both these teams are from boxes marked as ref. 28. In the catalogue the figure is similar to the team on the right here, except for a sock variation (the socks are white in the catalogue). The figure on the left has lots of extra trim. In the early days, when catalogues were not illustrated, the team colours had to be described. For some descriptions, more than one colour is used. For example, ref 27 (Hearts) is described in 1968 as "Maroon (or claret)". Did this mean that two different versions were produced? To my knowledge, it doesn't seem to. Tangerine, yellow, old gold, and amber are all used as descriptions for figures that often look very similar. Things are not helped that much by the arrival of the illustrated catalogues. The printing process leads the dark navy blue teams (ref 44, 154) to show as black in the "zombie" catalogues of the late 1970s. Red and wine red don't look very different here either. 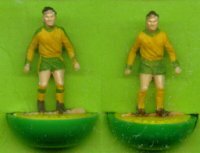 In general, Subbuteo used quite a small range of colours for the hand-painted range. The standard red, blue and green are used for just about everything. However, some of the lesser used colours do have variations. There are two very distinct versions of ref 55 (Anderlecht) and the grey on team 106 (Alessandria) can be light or dark or somewhere in between. Example 3: No 47. Southport. These two figures are both No.47. Unfortunately, the figure on the left is not a pure example, as the blue shorts have been badly over-painted with black by its previous owner (Humbug!). However, the orange is original. Contrast this with the yellow shirted version. Actually, this example is allowed for in the catalogue descriptions. In the 1960s catalogues, the shirt of this figure was "amber", while in the 1971-72 catalogue it is "tangerine", (which is the darker colour shown here). By 1973-74 when the teams are illustrated in the catalogues, this team is back to amber. Worth mentioning, but not really worth getting excited over. The hair and boots on a figure can be painted brown or black. These always match (i.e. you don't get black hair with brown boots). Teams do seem to have a standard hair/boot colour - i.e. on Chelsea (ref 42) they are brown. You will usually find that if a team has any black in its kit, then the boots and hair will be brown. However, I'm not convinced these colours are completely set in stone. 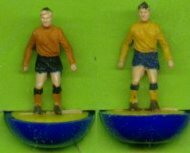 Variations probably exist, as they do in all things Subbuteo. Example 4. Heavyweight Brighton and Hove Albion (ref 51). Once again, this is a minor thing, unless you are trying to match a couple of spares to an incomplete team set. On the Brighton sets shown above, not only do the figures have different base colours, but the painting style and even the colour is noticeably different. I have played these two teams against each other without problems. 8. Changes that made the catalogues in the heavyweight era. The first complete kit change is in the 1950s, when Bradford Park Avenue were wound up, and their number (19) was reused by Barcelona. In the 1960s, big changes in colour by Crystal Palace (40), and Plymouth (54) were seen, as well as a few other changes in shorts colour. And in the 1970s, the french sides between 139 and 143 changed several times, but at the same time, other kits were left in the range even though nobody had played in them for years. As these changes have made the catalogues, I've been able to include them in the normal lists. That's probably enough problems for the time being. Time to go somewhere else.